I almost didn't like Tokyo 42; I should tell you that now. I mean, let’s be clear, there were loud voices in my personal choir of taste that wanted me to love the game from the beginning. It is, for one, gorgeous in its bright isometric Katamari-colored future look. It's also peppered with scifi references in the best possible way, dropping them in without announcing that it's doing it, but, to fans of the many IPs it touches, being clear about wearing its influences on its digital sleeve. And to take on an isometric perspective future open-world concept and give it elements of stealth, puzzle, bullet hell and narrative scifi adventure games, well that kind of confident smash-uppery is something that has automatic appeal for me. But, there is the other hand. This isn’t an even game; it’s not the best paced, and it felt for a long time like the content outside of the visuals and references wasn’t living up to all the aforementioned good qualities that this title has to offer. The aesthetic here is killer. Isometric. You hear the term all the time: Lots of games use the perspective, but this is the isometric game in my mind, now that I’ve spent a good amount of hours with it. And this is from a Baldur’s Gate II-obsessed, X-Com-loving fan of the isometric. 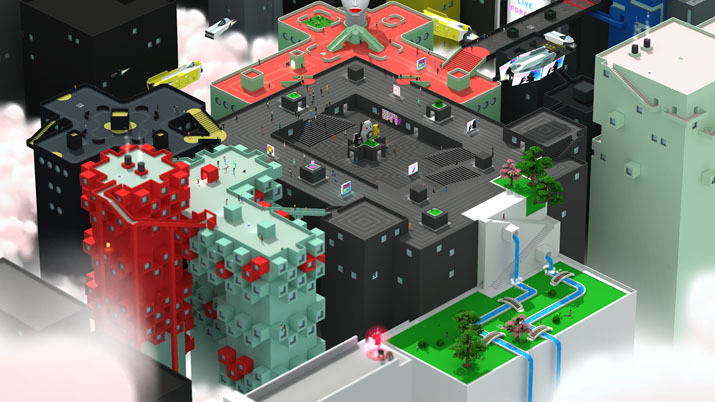 There are better games that happen to use isometric perspective, yes, but Tokyo 42 is the game that takes isometric and makes it a central figure in its idea and makes that work to a point that causes it be without question one of, if not the, defining isometric games of all time. It’s so prevalent and important to how this game works, that it’s easy to believe that the whole concept of the game came from someone doing up some mock art in isometric perspective and pitching that alone, and then the devs just went from that launch pad to what we have now. The whole world is a spectacle in Tokyo 42. It is, to put an easy term to it, overwhelmingly cool-looking. After the opening scene, your comparatively small avatar is thrown into this towering, chaotic, overblown isometric idea of a future Tokyo. And the design of all of this is spot-on good scifi glory. The world here, though open, is meticulously crafted to be pretty and fun. Buildings are all unique and awesome (clearly someone or two on the dev team is aware of modern and post-modern architecture), there are random features like giant human heads, weird cat and spider sculptures, tons of interesting and fully-fleshed out spaces like markets and squares and gardens, and over over my hours of play, I realized that though you see some of the same spaces a lot within the first half hour to hour, the actual whole of the open world here is gigantic, and as enticing as it is big. Damn, I mean just typing this, I’m itching to get back to it and bound off the top of a beautiful tower and out into the cluttered air, trying to land cleanly on the next skyspace over, people and cats and bullets and colors zooming past my soaring cyberpunk bod. 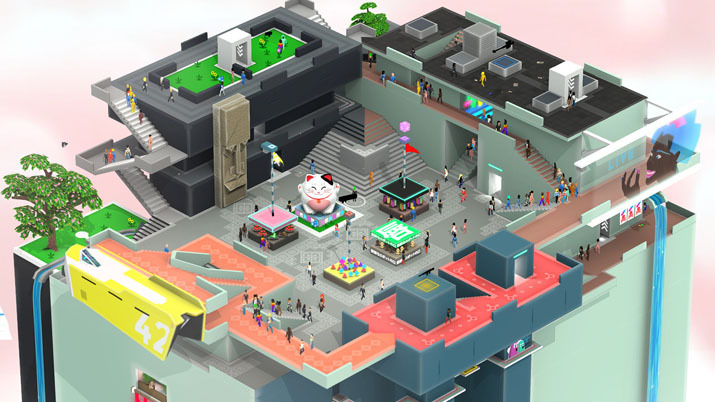 It is visual, visceral exhilaration you get in Tokyo 42, one that’s nearly unmatched by any other game I can think of. And while you are yet a small few pixels running over its eminent depths, you are a person of action in this world. You can own these 3D spaces with your presence. It takes a lot of civilian murder to get the cops’ attention in Tokyo 42, so you can pretty much murder at will, and there’s no damage done to you by physics at all, so you’ll be Ghost in the Shell-style leaping down the side of multi-hundred-foot skyscrapers almost every time you go anywhere in the game. That, if it doesn’t tell you from the description alone, is a ton of futurey fun. What you’re actually doing in this sprawling saturated world, besides goggling at it, is mostly fulfilling contract murders (well that and chasing a cat at one point). The transition from running around to combat is seamless, as you never leave the open world or the isometric perspective, and while there are dialogue pop-ups and a few menus for mission selection, there aren’t any cutscenes or anything else that takes you out of this view of Tokyo. Even the map is just a zoomed out differently colored version of the same view you always have with icons and indicators on it. That seamlessness is a neat trick, and one that works great for keeping the energy high and you immersed, and, especially once you really get into the story and start unlocking a wider variety of missions that take you to more of the map, it’s easy to want to keep playing mission after mission. Those missions themselves are fairly straightforward, usually. Typically they involve killing someone or multiple someones, usually in an area of the map surrounded by other baddies. Combat itself is pretty simple: You have a katana, grenades and a variety of guns, some of which are purchasable and some of which you get free. The katana just has one attack (and one animation for it), and the guns basically just fire a variation on the same bullet, either firing more of them at a time, firing faster or being “louder” (this last mechanic hasn’t actually mattered yet in my play-through). The way it all shakes out in combat is that you typically sneak around using some very basic stealth mechanics for a while, katana-ing dudes until someone sees you and everyone starts shooting. In terms of the stealth, you can crouch, people have cones of vision that will make everyone hostile if you stay within them for too long, and if you leave their vision, they’ll remember where you last were and what you looked like. If you have the energy to do it (an in-game value that you can charge up on special pads scattered around the city), you can change your skin to look like a random other person, and if you do that when the enemy can’t see you and you aren’t shooting anymore, they won’t know it’s you. The shooting itself is a play on bullet hell mechanics, with shots taking time to travel across the screen, forcing you to both dodge them and attempt to get the path of your own shots to run into an enemy. It’s all pretty simplistic, but it can also be very fun, especially on these gorgeous isometric levels. Leaping from building to building firing down at a horde of scattering enemies is giddy fun, as is running up on a passel of goons in a crowded public area and popping off those first few shots, sending the whole place to straight to chaotic hell in seconds. The story behind each mission is usually pretty fun as well, usually half-serious cyberpunk with a lot of influences from other entries in the genre (Blade Runner, Shadowrun, Akira, the aforementioned GitS) and half humorous, which was always pretty spot-on. That said, these missions can get frustrating, and I often found myself wishing there was more in the way of mechanics. The frustration typically occurred in two ways: First, you have to move the camera around constantly with keyboard keys while moving around, typically while your hands are already busy avoiding bullets or (god, this was the worst) trying to control the very difficult motorcycle, so it’s not the easiest thing to do, and it will get you killed at least a few times. That’s not super awesome; death by camera is never something I can feel is actually part of the fun challenge in a game. The second issue is that the bullet hell and the fact that you only really have the ability to run, crouch and attack mean that combat doesn’t always feel like it’s about skill, but more about just getting lucky and surviving. I had to redo a few missions over and over because I kept getting randomly killed, and while this isn’t a game that totally lacks skill, it’s also not one that makes you feel like there’s a lot you can get better at. You can really only retry the mission and hope you’re luckier in dodging, or you can maybe try to walk into the area from another side or use a different weapon, but frankly, Tokyo 42 just doesn’t feel very “deep” in the mechanics aspect, especially when you start getting frustrated that you’re stuck on one part. I mean, I was literally screaming at my computer after I messed up one of the motorcycle missions for the (no joke) 40th time in a row, and that is never great. My main complaint with Tokyo 42 deals with those simple mechanics, and I’ll admit, it’s colored by my own preferences in gaming. With such a gorgeously realized and detailed world, and with a narrative and writing style that work very well, I found myself at times, especially in the early missions, wishing this wasn’t such a fast-paced action game. The quality here begs the question: Could this have worked better as an RPG or with a slower combat system, maybe something turn-based. I wanted to spend time in this world, wanted to go in its buildings, talk to its people, be involved in its world. However, as I say, that feeling was primarily felt in the early missions. The more I played, the less I was bothered by the frustrating moments and the simplicity of the mechanics, because after an hour or two, the world really opens up, you have more options for types of missions and people to talk to, and the narrative becomes more complex. Do I still wish there were more RPG elements, maybe some way to level your character, maybe an item system, maybe a home base and some parts that weren’t all action all the time? Yeah, but that doesn’t take away from what’s awesome about this game, which is that it is one of the most unique, best-realized and most beautiful game worlds I’ve ever seen, and it only gets better the more you explore it. While Tokyo 42 could be deeper, and it has issues with being frustrating at times, this is the rare game that becomes less problematic the more you play it. It is for brutal combat what Katamari was for puzzle games: A new way of looking at things, quite literally, and one that chooses bright joyfulness as its medium and lives up to it through its play. For less than half of what a AAA game will run you, this title is absolutely worth the time and the money, and if you find it frustrating, I encourage you to give it another few hours. 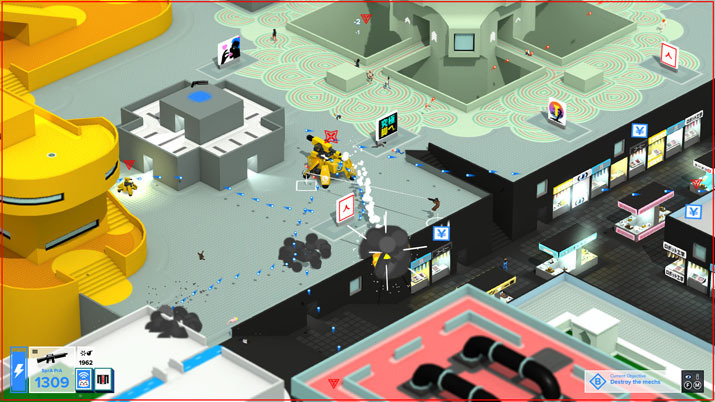 Just about anyone who does will be charmed by the supersaturated, gloriously isometric, high octane, quirkily funny cyberpunk blowout that is Tokyo 42.